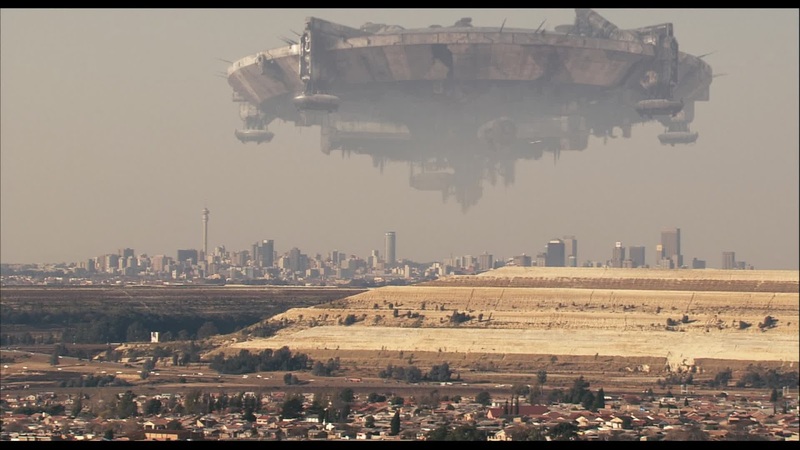 Starting out in faux-documentary format, District 9 catches the viewer up on some alternate history: In 1982 a giant disc-shaped spaceship appeared above Johannesburg, South Africa. After it fails to pose any particular threat, a team of investigators was sent up to cut their way in. What they found were thousands of alien refugees confined in miserable conditions. With the eyes of the world turned upon them, the South African government along with MNU (Multinational United, a private security contractor) undertook to house and feed this unexpected population (pejoratively labeled Prawns, due to their crustacean-like appearance), establishing them in a settlement called District 9. Surrounded by barbwire and regulated by military forces, its quickly became a crime-ridden slum with a thriving black market; the principle trade being alien weapons (which are keyed to operate only with prawn DNA) in exchange for cat food (which the Prawns respond to as both an essential nutrient and addictive drug). Our ‘hero’ is Wikus van de Merwe (Sharlto Copley), a blundering minor functionary at MNU who is put in charge of a politically popular but human rights-violating plan to evict the denizens of District 9 and relocate them some 200 kilometers away from the city. Though he’s actually quite an expert on the Prawns, speaking their language fluently and showing a familiar knowledge of their habits and conditions learned from attending frequent weapon raids, he owes his position solely to his father-in-law, the ruthless chief executive of the company. It goes without saying that the aforementioned executive thinks his daughter could do a lot, lot better. Wikus treats the Prawns with the casual condescension of the well-informed anthropologist, but he’s still a far cry more sensitive than the trigger-happy security forces. While serving eviction notices, Wikus is accidentally exposed to an alien liquid being collected by Christopher Johnson (a Prawn attempting to repair the spaceship’s command module so his people can return home) and begins mutating into a Prawn himself. The MNU, whose real goal is to find a way to make the Prawn weapons human-usable, immediately understands the genetic potential of this hybrid and kidnaps Wikus. 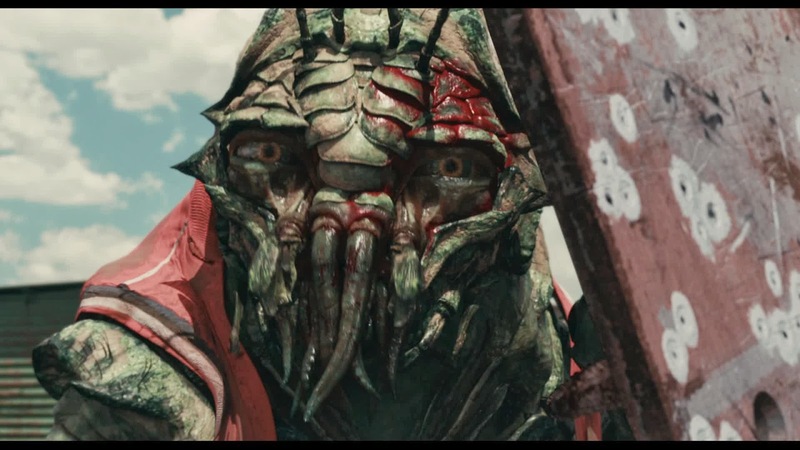 After his father-in-law heartlessly signs his death warrant, Wikus breaks free and goes on the lam in the one place he can safely hide: District 9. There he teams up with Christopher Johnson and his son, experiencing the cruel extent of the Prawns’ predicament firsthand while hatching a scheme to save them and, hopefully, himself. 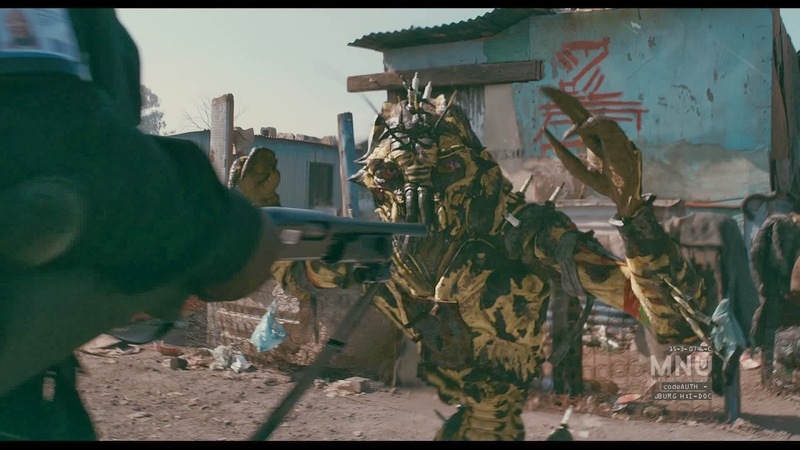 District 9 is foremost a masterpiece of world-building, the art of creating a convincing alternate universe with a sense of the interrelated complexities of a fully developed history, culture and economy while giving the impression that it extends beyond the frame of the narrative. The film is clearly a labor of love, full of easy-to-miss details and ably supplemented by a wealth of special effects that didn’t cost the fortune one would assume (the film’s $30 million budget is huge, but not for this level of production value). Every element of the art direction shows care, commitment and inspiration: the biology of the Prawns and the fluidity of their insectoid movements, the ogle-worthy weapon, vehicle and technology design, and the gutsy use of actual Johannesburg locations teeming with makeshift hovels cobbled from corrugated sheet metal and repurposed timber and doctored up with just the right amalgam of salvaged junk and extraterrestrial garbage (they paid an enormous amount of attention just to the trash!). The arc of the story and Wikus’s central role are both satisfying, but director Neill Blomkamp’s talent and originality tends to shine brightest in the fine-grain minutia and the large scale vision, while in the human/prawn-sized zone in between there are a few characters (especially the villains) who suffer from one-dimensionality or simply disappear from the plot. 2009 was a banner year for science-fiction, including surprises like District 9, Mr. Nobody, Moon, The Watchmen, Splice and The Road in addition to popular hits like the Star Trek reboot, The Time Traveler’s Wife and Avatar, the latter of which became the highest-grossing film of all time (as of 2014). But one of things that made District 9 standout is its thematic relevance and allegorical heft, tackling in an unforced and yet decidedly direct manner topics like refugee resettlement, racism, apartheid, modern-day mercenaries (I mean, ahem, “private security contractors“), human rights abuses, slumifcation, immigration reform, stateless nations, cultural-linguistic divides, covert weapons programs and multinational corporations operating above the law. District 9 is distinctly 21st century in its concerns, returning sci-fi to the arena of contemporary discourse by thinking beyond the oft rehashed first-contact scenarios that emerged in the 19th and early 20th century (alien encounters as a metaphor for fascism and imperialism), the Cold War (hive minds, brainwashing and the threat of apocalypse) and late 20th century (technological enslavement, environmental depletion, etc.). Consider, by comparison, the way that Avatar makes rather graceless stabs at topicality, broadly gesturing towards the Iraq War, while essentially presenting a feel-good revisionist history of Europe’s clash with Native Americans. Just browsing through and I found another of my favourite. 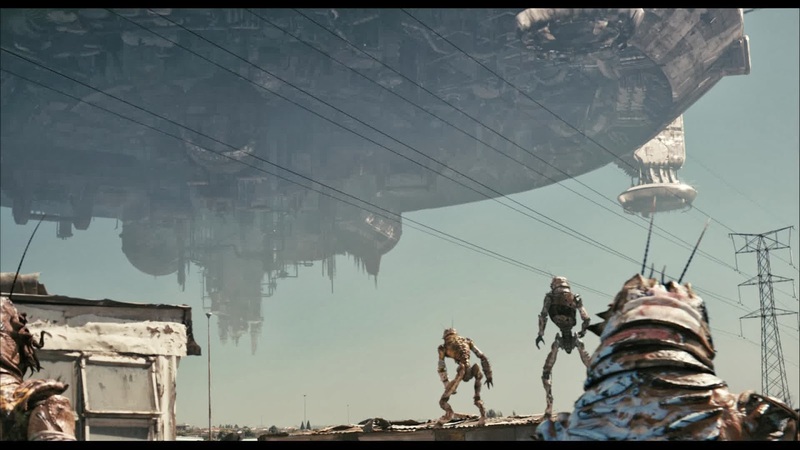 District 9 was one of those movies that I started watching not really expecting anything except an ordinary scifi, and after haflway I was paralyzed by catharsis. I only could just recommend this movie to anyone, it is really a standout among the many aliens destroying earth movies and tv series.